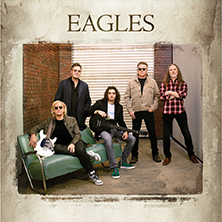 The Eagles, a seminal and influential American rock band, formed in 1971 and went on to become one of the most successful bands of that decade, with six albums reaching number one and five singles doing the same. The band broke up in 1980, reformed in 1994 and released album Hell Freezes Over. Since then they have performed live sporadically. Long Road Out of Eden, their first studio album since 1979, came out in 2007 and was supported by an extensive tour the following year. The Eagles album Hotel California featured 37th by Rolling Stone Magazine in their Greatest Albums of All Time poll.